Although the long-term financial impact of tariffs on imported steel and aluminum (e.g., aluminum printing plates and foreign-made printing equipment) is uncertain - due to varying percentages and exceptions made for certain countries - preliminary countervailing and antidumping duties now being added to the price of imported Canadian uncoated groundwood papers is certainly causing havoc for U.S. printers and publishers of newspapers, directories, books and advertising circulars. Due to combined tariffs of up to 32%, as I write this newsprint is averaging around $655 per metric ton, with further price hikes already announced. The preliminary countervailing and antidumping duties that have been slapped on imported Canadian uncoated groundwood by the Department of Commerce emanate from a complaint filed by North Pacific Paper Corp. (NORPAC), a single-location paper manufacturer in Longview, Wash., which is said to be owned by a New York-based hedge fund. In January, the Department of Commerce assessed preliminary countervailing duties on uncoated groundwood ranging from 4.4% to 9.9%, depending on the Canadian manufacturer. Then, last month it added additional preliminary antidumping duties, on top of the countervailing tariffs, of up to 22.16%. The International Trade Commission (ITC) is expected to make a final determination in mid-September following a public comment period and hearing, and the Department of Commerce will reportedly issue a separate ruling on the dumping charges in August. In response, a coalition called STOPP (Stop Tariffs on Printers and Publishers) has been formed to persuade the ITC and Congress to reject the tariffs. Comprising printers, including Quad/Graphics, Valassis and Worzalla; newspaper publishers; paper mills and distributors; and several industry-related associations; STOPP (visit www.stopnewsprinttariffs.org) contends that NORPAC’s claims of infringement ring hollow on several fronts. For example, STOPP points to an ITC report issued last September that recognizes “newsprint tends to be supplied by producers in that region,” and that pricing subsequently reflects the regional marketplace. 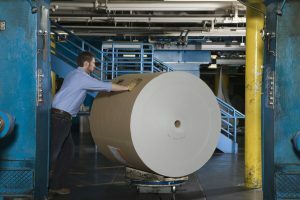 The report also found that almost 91% of imported Canadian newsprint comes into the Midwest and Northeast, while only 4.6% enters the Pacific Northwest, where NORPAC does business. In addition, STOPP contends that the shift to digital alternatives is causing financial harm to U.S. uncoated groundwood manufacturers, not unfair pricing from Canadian imports. It notes that the demand for newsprint in North America has shrunk by 75% since 2000, primarily due to the strong headwinds that newspaper publishers have faced. As a result, several newsprint mills have been shut down, while others have been converted to manufacturing linerboard for corrugated boxes in response to the growth of online shopping driven by the likes of Amazon. Since 2007, 78 machines have been closed or converted, according to the coalition, eliminating more than 10 million metric tons from industry production capacity. Ironically, the higher prices for uncoated groundwood and supply destabilization caused by the tariffs will also impact NORPAC negatively. If made permanent, STOPP points out, the duties will drive a further reduction in uncoated groundwood paper demand, as newspaper, book and other print-based publishers have to cut their print production quantities, shift to smaller page counts, seek digital alternatives and, in worst case scenarios, even shut down and lay off their workers. Impacted printing and publishing companies would find it difficult to pass along the paper price increases to their respective customer bases, and are already operating at too thin margins to be able to just absorb them. The damage from the tariffs would also have a ripple effect. It will hurt ink and other consumables suppliers, printing equipment manufacturers, as well as a long list of providers throughout the total supply chain. Frankly, it’s sad that a paper company like NORPAC - with under 300 workers - could thwart a U.S. printing/publishing industry employing hundreds of thousands.